"For me, money is an ingredient that makes things interesting. Without salt, you can not consume food properly. Without money, sport does not mean anything to those who win the races. It is very important." - Kenenisa Bekele in an in-depth look at his monetary earnings from running by Fortune magazine, based in Addis. Read more about Bekele and his astounding 5,000m and 10,000m win streaks in our Week That Was. 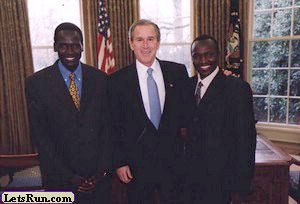 *Kenyan Press Blasts Some Kenyan Runners For Not Talking To The Kenyan Press They were willing to talk to LetsRun.com! Janeth Jepkosgei here, Asbel Kiprop here, and of course a hilarious Ezekiel Kemboi here. Unexpected News: Shalane Flanagan Volunteer Coaching At UNC This Fall This might be good "down-time" for the normally very focused multiple American record holder. She had been training with Jerry Shumacher and the Wisconsin boys in Portland. LRC co-founder Wejo interviewed her after her disappointing 10k in Berlin (see the interview here). Paula Radcliffe To Run World Half Marathon Paula R, the women's marathon WR setter at an amazing 2:15, will suit up for Great Britain on her home soil in Birmingham. The race is October 11 and also will feature Dathan Ritzenhein of the US. *Too Close To Call: Semenya Results Must Be Given To Independent Agency For Further Investigation We say "tie goes to the runner" and leave her alone. *Awesome Semenya Quote: "God made me the way I am and I accept myself. I am who I am and I'm proud of myself." Of course, this quote goes along with a fashion "makeover" for the biggest English language magazine in Africa, but we don't blame her for cashing in on her celebrity. *Return Of The Road Warriors! Sammy Wanjiru To Race Sammy Kitwara In Sep 13 Rotterdam Half Marathon The 22-year-olds get to duke it out. Yes, they would be redshirt juniors if they were in college in the US. Colleen DeReuck And McMillan Elite's Brett Gotcher Win New Haven Road Race *USATF Press Release Brett Gotcher got his first-ever US title in a sprint finish over fellow Flagstaff resident Mo Trafeh while DeReuck, 45 years young, set an age group world record by 7 minutes in an astounding 67-minute win. Rojo-coached Zac Hine ran well in the LetsRun.com singlet to get 13th with a strong 1:00:47 in his first post-collegiate race. Mary Keitany Runs 67:00 Half Marathon In Lille 3 men broke 60 minutes as well. Mary Keitany is one of the fastest-ever women's half marathoners with a personal best of 1:06:48. 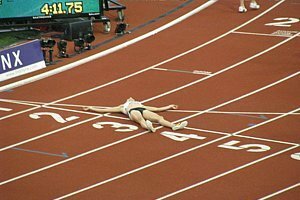 LRC Zürich Photo Album - Beautiful photos of Yelena Isinbayeva setting the new pole vault world record at 5.06m, Ken Bekele after his 16th-consecutive 5,000m win, and the great Usain Bolt being carted into the stadium (literally, he is in a human-drawn cart reminiscent of Roman Emperors). LRC Rieti Photo Album - This daytime meet produced the fastest 800m run in over 12 years thanks to 20-year-old Kenyan David Rudisha. 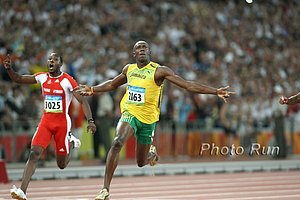 Plus see pics of Asafa Powell having fun winning thanks to Usain Bolt taking a rest. LRC RNR Va Beach 1/2 Marathon Photo Album - Photos from the team battle in Virginia Beach on Labor Day weekend. LRC Vlašić Vs. Friedrich Photo Album - Currently, the most glamorous event in the world is probably the women's high jump. These photos show the Vlašić/Friedrich battle from Berlin, as the crowd tried to spur the German to victory over the Croatian.